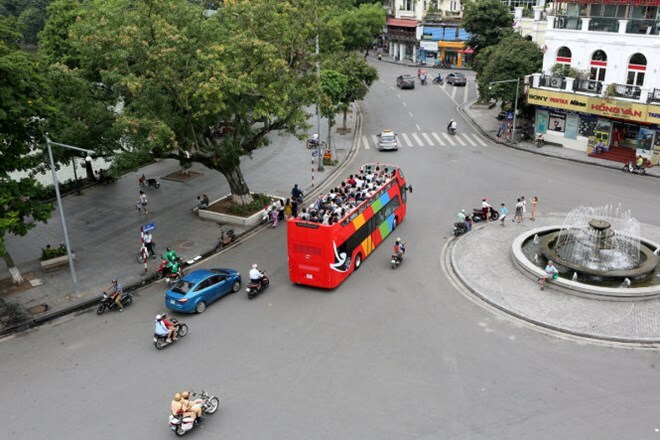 Hanoi (VNA) – The Hanoi Transport Department has urged the Hanoi Transport & Services Corporation to complete its plan to soon put into operation the City Tour route by double-decker tourist buses. To ensure a safe operation of the buses, the department also asked for the improvement of infrastructure facilities along the route, including clearing electricity wire system and advertisement boards. The first double-decker bus to ferry tourists around the city started its trial run in Hanoi on June 30. The bus, painted a cheerful red, has 14 seats at the lower level and over 30 seats on the open top level, which has a mobile roof that can be closed during bad weather. It departs from Hanoi Opera House and runs through Hoan Kiem, Ba Dinh and Tay Ho districts, taking tourists to popular attractions such as the Ho Chi Minh Mausoleum, Temple of Literature and Old Quarters.